Will fake killer whale fool sea lions in Astoria — and what if it does? I was eager to find out if a 32-foot fiberglass replica of a killer whale could scare off a huge number of sea lions crowded together on the docks in Astoria, Ore. I kept telling my wife Sue, “It’s not going to work” — and I had not the slightest idea that the motorized orca might capsize during its attempt to frighten the persistent sea lions. About 1,000 people were on hand last night when a human operator drove the orca toward the sea lions, according to Associated Press reporter Terrence Petty. A passing cargo ship created a wake that rushed toward the shore and capsized the fake killer whale. And that was that for now. You can read the story in the Kitsap Sun. I understand that the fake killer whale might be deployed again against the sea lions in August, when their numbers are expected to be high again. I still doubt that it will work — unless the operators can find a way to aggressively approach the sea lions and stay with the effort for an extended time. 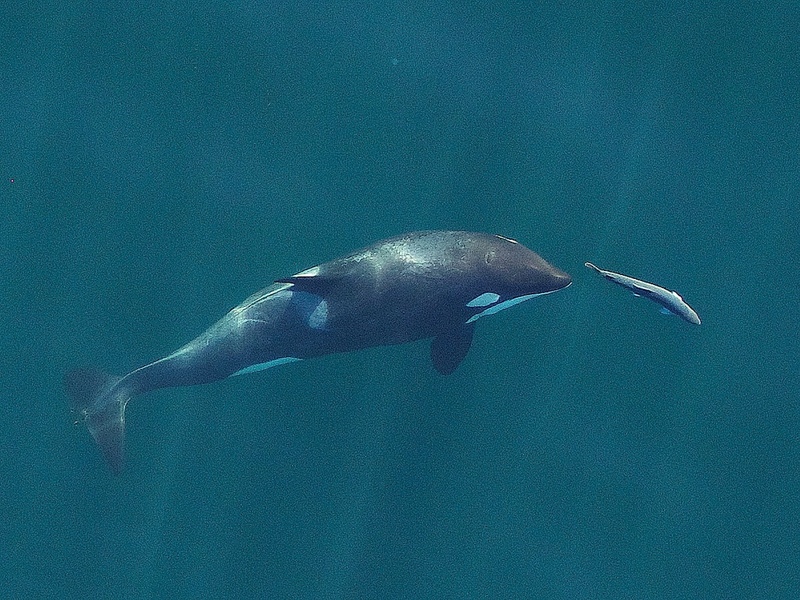 It might help to play recordings of transient killer whales — the kind that eat marine mammals. But my understanding is that transients don’t make many sounds when they are in their hunting mode. I readily admit that I’m not a killer whale expert, but let me tell you why I believe that any sort of limited effort with fake orcas will fail. It’s not that sea lions don’t fear transients. In fact, if sea lions can be convinced that they are being approached by a real killer whale, their fear level could be quite high. I’ve heard from homeowners who live on Hood Canal, Dyes Inlet and other shorelines that when transient killer whales are around, seals and sea lions head for shore, climb up on docks and even attempt to board boats to get away from them. So I don’t know if the fiberglass orca will fool the sea lions in Astoria, but does anyone think that these marine mammals are crazy enough to jump into the water if they believe a killer is there waiting for them? Who would expect a thieving sea lion to attack after you’ve landed your trophy fish, taken it back to the dock and hauled it out for a video shoot? The video, which has gone viral over the past three weeks, has a story behind it. The two characters on the dock are in the midst of filming a new reality show called “Chef on the Water,” a program set to run on The Travel Channel. The program involves an accomplished chef who is asked to catch his food before preparing it. UPDATE: Some opponents showed up at A Seattle hearing the next night, including activists bearing signs that said, “We will knit for dolphins.” I’ve added some information from the Los Angeles Times at the end of this entry. In a public hearing last night, nobody stood up to protest the U.S. Navy’s use of guard dolphins and sea lions in Hood Canal. My colleague Ed Friedrich, who wrote a story for today’s Kitsap Sun, pointed out that, unlike a “scoping” meeting two years ago, nobody came to the meeting knitting sweaters, hats or mittens for the dolphins. According to the Navy, studies have shown that the dolphins can tolerate the cold water fairly well. To be sure, they will be asked to patrol for only a couple of hours at a time, after which they will return to a warm-water enclosure. About 50 people showed up, and only two testified. I wouldn’t be surprised if some people chose to attend the Puget Sound-Georgia Basin Ecosystem Conference in Seattle instead of the hearing. But everyone will have another chance to testify tonight. Judy Dicksion, who has worked as a volunteer observer of marine mammals in Hood Canal, said the Navy went out of its way to address her concerns. Pete Schroeder, a veterinarian who specializes in marine mammals, said the Navy’s marine mammal research program is the best in the world. “These animals will be safe, and in my experience they will be happy,” he said about the guard dolphins and sea lions. I know that a number of people have serious concerns about this program — including possible questions of morality, as demonstrated by comments on this blog. The only other hearing on the environmental assessment will be tonight from 5 to 9 p.m. at Tyee High School, 4424 S. 188th Place in SeaTac. An open house is from 5 to 6:30 p.m. followed by a presentation and testimony after that. It would be great to get a report from anyone who attends that hearing, and feel free to post your opinions here. You can review the Navy’s program at the Web site called Swimmer Interdiction Security Program. The Navy is back to talking about using dolphins and sea lions for patrolling Hood Canal for enemy swimmers near the Navy’s submarine base at Bangor. Navy officials say there’s really not much difference between using guard dogs to patrol a facility on land and using guard dolphins to patrol a facility on the water. A story in today’s Kitsap Sun by Ed Friedrich indicates that the Navy is committed to carrying out some kind of “swimmer interdiction security program.” Four alternatives are up for public discussion: using California sea lions and Atlantic bottlenose dolphins; just sea lions; combat swimmers; remotely operated vehicles; and no change. The preferred option is both dolphins and sea lions. In one possible program, dolphins would be trained to drop a lighted buoy near an enemy swimmer. In another program, sea lions would learn to clamp a cuff on a swimmer’s leg so that the enemy could be reeled in like a big fish. Ten years ago, the Progressive Animal Welfare Society and other environmental groups sued the Navy over its plans to deploy dolphins at Bangor. The Navy eventually agreed to withdraw the proposal until a full environmental review could be completed. Two years ago, the Navy started through the environmental analysis, and PAWS prepared for another public campaign and possible legal action. The group’s primary objections centered on the cold water of Hood Canal, which is not the dolphins’ normal habitat, and the fact that the captive animals would never be free to swim in open waters except when on duty and under the control of humans. For information, check Navy Web sites about the marine mammal program and analysis of the Bangor Swimmer Interdiction Security System.